When Albion College hands you a cancelled class, make a new signage system for Whitehouse Nature Center? At the beginning of this school year, Kassie Wright, a senior from Marshall, Michigan, found herself without a first-aid class, cancelled due to a lack of staff able to teach it. Rather than fulfilling the role of a typical college student and using her newfound free time to take naps and watch Netflix, Wright decided to do something more beneficial to the community around her. Wright, an English major with a psychology minor and environmental studies concentration, made her way to Doug White, biology professor and director of the Center for Sustainability and Environment, to ask if there was anything she could do to fulfill the required internship or research project for her concentration. In order to develop her plan for a new signage system, Wright spent a copious amount of time studying the current signs in the Nature Center as well as other nature sites in nearby cities, including Marshall, Homer and Jackson. 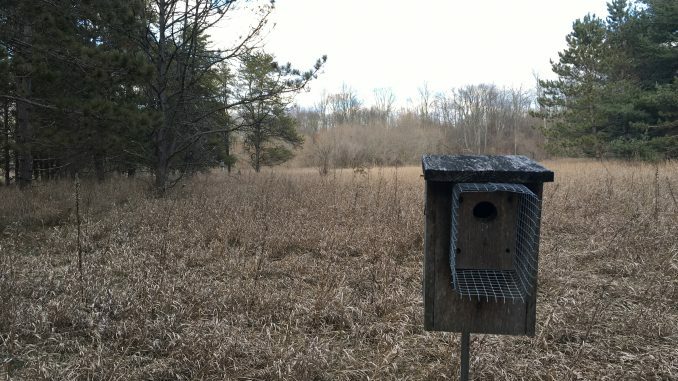 Combining Wright’s research with White’s knowledge of nature centers he had spent time visiting outside of Michigan, the two began brainstorming ideas for a new Whitehouse Nature Center trail system.. But Wright’s efforts paid off. She ended up getting around 75 students to fill out her surveys. With new data collected on student opinions, Wright’s work with White on the Nature Center signs began to take off. As Wright delved further into the project, she found herself becoming more and more passionate about the work she was doing. While the question of getting lost or even hurt while venturing through the Nature Center could be answered by using a map, the Nature Center’s was outdated. Mick McRivette, assistant geology professor and Geographic Information Systems instructor, is working to revamp a new map for the Nature Center, one which will not be inclusive of the changes that have been made to the original trails over the years. The Nature Center is supposed to be welcoming to all students, but, Wright believes a that with lack of signs, updated maps or knowledge of the trails, it’s easy for visitors to get lost. This new signage system is meant to make Whitehouse Nature Center a more inviting environment for all. Wright will be participating in the Environmental Club’s Green Day celebrations on Thursday Nov. 15, from 6 to 7 p.m. in the Kellogg Center collecting more surveys on student opinions regarding the signage system. From there, Wright hopes to have her proposal turned in by early spring. The new system could be implemented soon after.